The Annual WBSC Baseball and Softball Award Winners for the 2014-2017 quadrennial were announced. GABORONE, Botswana　October 16, 2017 -　The WBSC Congress is officially over. Saturday’s gala dinner was the last act of an intense 3 day programme. 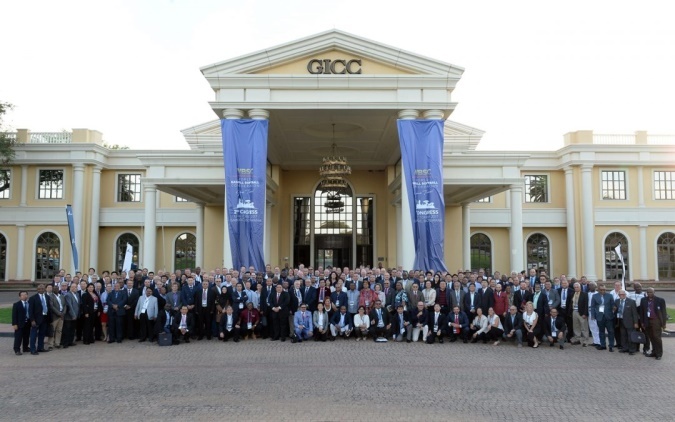 In the cover picture (Monirul Bhuiyan): all delegates pose in front of the Gaborone International Convention Centre (GICC). President Riccardo Fraccari summarized the results during WBSC Ordinary Congress: “These days we have worked hard to grant a bright future to our organization. We have updated our Constitution to the real needs of a true, unique, big Federation. We have elected the new Executives of the Baseball and Softball Divisions, to whom I would like to extend my best wishes for the new challenge, as well as a special thank for the work done to the ones that have passed the ball”. Fraccari added: “Starting from tomorrow, new challenges and more work are ahead of us. We have to put in action the decisions taken during these days, by activating and putting the Divisions in condition to work and implement all the necessary reforms. The goal is to give added value to our events, in order for them to provide economic resources needed to grant a bright future for our organization and for the development of baseball and softball worldwide. It’s open for everyone to see that in these 3 years baseball and softball have been under the same roof but, in relation to the organization of the international activity and the capability to generate resources, they have travelled at 2 different speeds. This cannot continue. Both disciplines are potentially interesting to the market and are potentially able to give value to their tournaments. On July 2017 we have presented in Lausanne our new logo, slogan and the project to become an even more dynamic and modern Federation. Game Time is our slogan. Our mission is to build a billion strong baseball softball community by 2024. We have to face the management of the 2020 Olympics in Tokyo, which is risulting to be very problematic and demanding, mostly due to an inexplicable behavior of the Organizing Committee. We have to communicate and organize the Olympic Qualifier, which not only will implicate a hard work for WBSC, but also a great commitment for all of you. We have to work together to show the international sports community that, as baseball and softball, we are a strong sport, a big movement which represents millions of athletes that work hard on a daily basis, even under difficult conditions and that their deepest desire is to be part of the Olympic Family”. On a final note, Riccardo Fraccari added: “The road ahead of us is hard and steep, but Paris 2024 and Los Angeles 2028 must represent our top priorities and for this no energy is to be spared. All together, we can achieve it”. At the Gala Dinner, WBSC revealed annual WBSC Baseball and Softball Award Winners for the 2014-2017 quadrennial.